The world woke up on the morning of November 7, 1919, to an amazing piece of news. A few months before in May, the English astronomer Arthur Eddington had led an expedition to the island of Principe off the west coast of Africa to try to observe one of the strangest phenomena ever predicted in the history of the science: the bending of starlight by the gravitational field of the sun. The phenomena could only be observed during a total solar eclipse, when the sun becomes dim enough to track the passage of starlight past it. Eddington’s analysis proved that the light was bent by an amount that was twice that predicted by Isaac Newton, often considered the greatest scientist who ever lived. The man who trumped the great Sir Isaac’s prediction had until then been a relatively unknown forty-year-old physicist working in Berlin. His name was Albert Einstein, born on this day in 1879. The observation of starlight bending was the first prediction of Einstein’s then otherworldly-seeming general theory of relativity: “One of the greatest achievements in the history of human thought. It is not the discovery of an outlying island but of a whole new continent of scientific ideas”, quipped the English physicist J. J. Thomson, discoverer of the electron. It was only the first among a stellar set of experimental observations that validated some mind-bending phenomena and ideas: spacetime curvature, black holes, gravitational waves, an expanding universe. It catapulted Einstein to world celebrity, and made him a household name and a part of the history books. More importantly for the sake of world peace, however, it underscored one of the finest moments in the history of science diplomacy. The world had seen its first brutal world war end just a few months before, when the guns had finally been silenced in August. The carnage had been unparalleled: more than 38 million casualties, with 17 million deaths. And in the light of this death and destruction, there was one country on which the world’s anger was focused: Germany. It seemed Germany had started the war and continued it, and it was fanatic German militarism that seemed to have sown the seeds of discontent. Einstein’s message here was clear. No matter what the political environment, science should trudge on, and political differences should not be a reason to squelch scientific collaboration. In fact such collaboration may be the only bond joining two countries together when all others have failed. 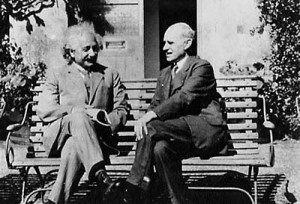 Eddington and Einstein’s plea for scientific fellowship has again become relevant, even as irrational nationalism has started to rear its ugly head, in the United States, in Europe and beyond. Demagogues with no understanding of science are trying to stem the flow of scientific talent from other countries, and no nation will be hurt more by this backward policy than the United States. More than any other single country, the United States has been the beneficiary of groundbreaking work by émigré scientists; in fact, the U.S. rose to scientific prominence when Jewish scientists fleeing from fascism in Europe migrated to its shores. It rose to world prominence in diverse scientific fields like astronomy, biomedical research and social science as these European immigrants and their students, along with others who came to the country during the last few decades from Asia, Africa, Australia and other continents, massively contributed to new scientific discoveries and inventions and won a string of Nobel Prizes. If the United States starts appearing as an unwelcome destination for the world’s scientists, doctors and engineers, not only would this be a scientific disaster but it will be a human disaster. Immigrant scientists are often fleeing from persecution, broken economies and shoddy education standards and therefore usually work extra hard to ensure that their work brings success to their adopted countries. They may not all be Christians, but as is clear from the educational attainment and income levels of so many of these immigrant groups, they often live and breathe the Protestant work ethic of hard work, honesty and perseverance. As exemplified by a letter written by the German émigré Hans Bethe to his teacher Arnold Sommerfeld, many of them come to love their country and demonstrate deep loyalty toward it. Einstein himself was of course one of the most important examples of the immigrant experience in this country; when he moved to Princeton in 1933, the center of world physics moved with him. Alienating these people would not just be antithetical to the universal fellowship of science but it would decidedly not be in the United States’ best interests; it is these immigrant scientists and engineers who have started companies worth billions, discovered new drugs, materials and species, and contributed to America's tremendous supremacy in the information age. Supporting these immigrants is in fact putting ‘America First’. One can have a perfectly reasonable discussion on limits to immigration without keeping talent away from these shores or without alienating potential immigrants who want to succeed in this country through hard work and family values. The current political environment has erased these important distinctions, if not explicitly at least in spirit, and it’s a distinction that we need to all clearly point out. The path ahead will not be easy, but as long as we support and understand each other, as long as we organize panel discussions and conferences and exchange programs which make people appreciate the international nature of science, we will move ahead together. All we need to do is have the Eddingtons and Einsteins among us keep finding each other. A correction: The WWI guns were silenced in November 1918 and not in August. The war did start in August of 1914.